With global warming threatening coastal cities and a new era of mass migration on the horizon, going mobile just might be today’s bright idea – and tomorrow’s way of life. Those who want to get rolling right away have a tantalizing choice of ambulatory abodes from which to choose. Here are a dozen tech-packed trailers that are full of Win… without the Winnebago. 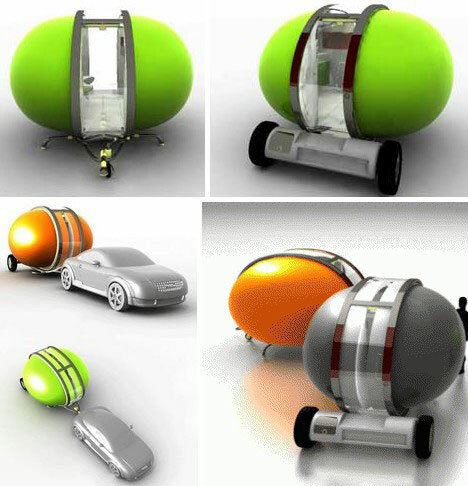 Slovakia-based Nice Architects has a nice idea for future mobile-homers: the Rolling Stone eco-capsule. Though not connected in any way with a certain English music group, a certain American pop culture magazine or a song by a certain singer named Bob Dylan, the Rolling Stone stands on its own when it comes to being environmentally friendly, self-sufficient and generally cute & cozy. Those who wouldn’t be caught dead in a classic, Harvest Gold motor home might find the svelte & stylish Mehrzeller much more appealing. 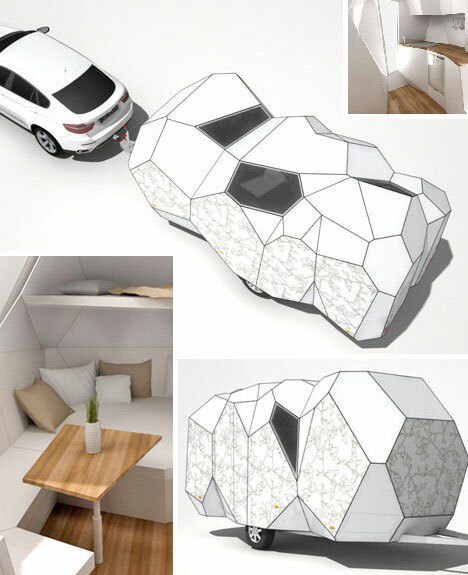 German for “multi-cell”, the Mehrzeller caravan concept maximizes interior space while displaying an organic, polygon exterior that resembles natural mineral crystals. The Mehrzeller hails from Graz, Austria, birthplace of another svelte & stylish object: California “Governator” Arnold Schwarzenegger. The 2030s, that is. 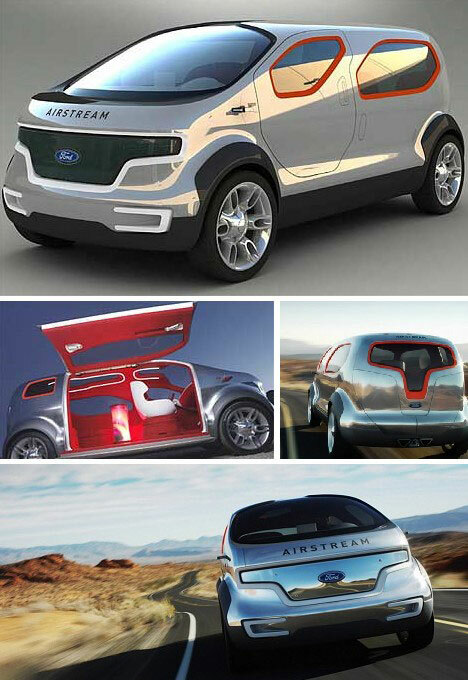 Actually the Airstream concept Ford’s been showing off lately looks both ways: its eco-friendly hybrid hydrogen fuel cell is most futuristic while the silvery style and iconic name harken back to the good old dust bowl days when hydrogen power was all the rage… until that idea went down like a lead zeppelin. 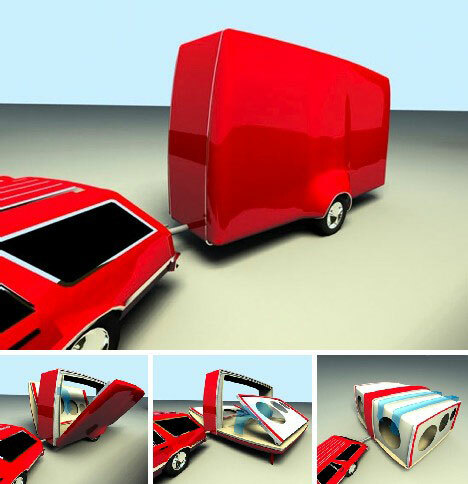 Dutch designer Niels Caris has created a foldout trailer called, naturally, the Foldoub Trailer. 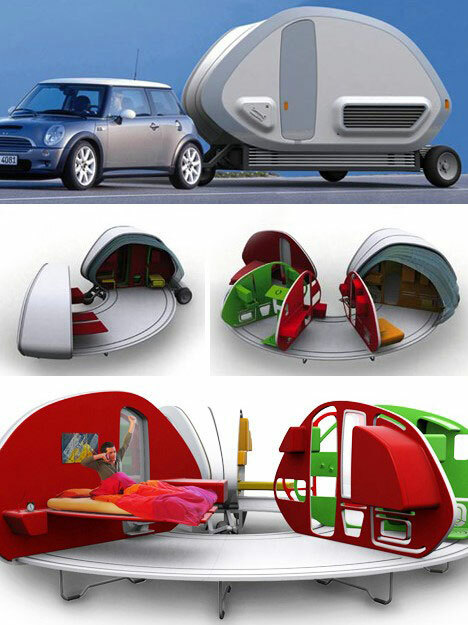 Tow, park, push a switch and the whole kit & kaboodle opens up like Godzilla’s big pop-up book of home design. On the downside, the Foldoub Trailer has no kitchen, bathroom or storage… which could be a problem if you’re parked 50 miles past the “100 miles to Next Gas & Lodging” sign. The 252° Living Area springs from the creative mind of French designer Stephanie Bellange. 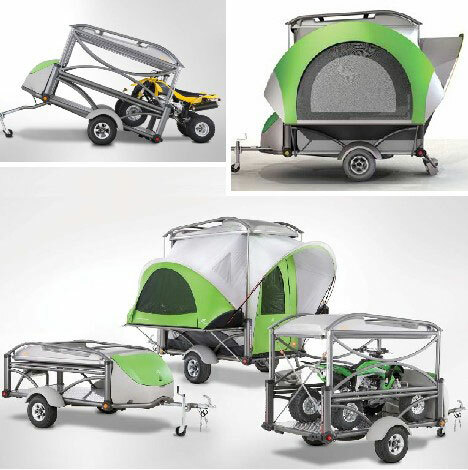 Small enough to be towed by a Mini, the 3-wheeled trailer features supporting feet that spread automatically once the trailer’s outside shell is opened. The interior parts follow, much like the petals of a blossoming flower. 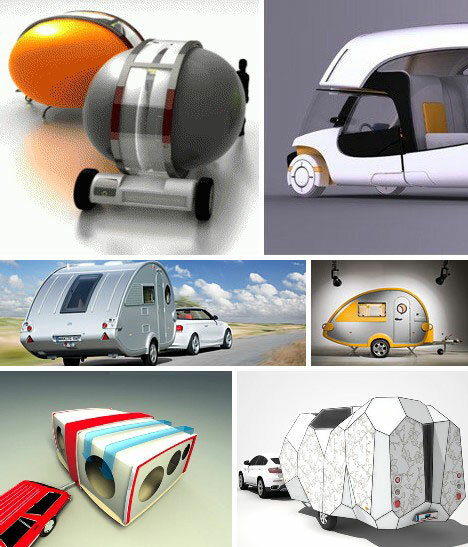 The Colim Modular Camper is a car, a trailer and a motorhome all in one. Park at your campsite, then tour the sites in the two-seater convertible module. The interior lives up to the exterior’s promises as well, with flowing, organic surfaces and eye-pleasing colors – not a splinter of plastic wood anywhere. The Colim Modular Camper is eco-friendly as well, with a solar panel on the roof and a hybrid engine nestled under the hood. 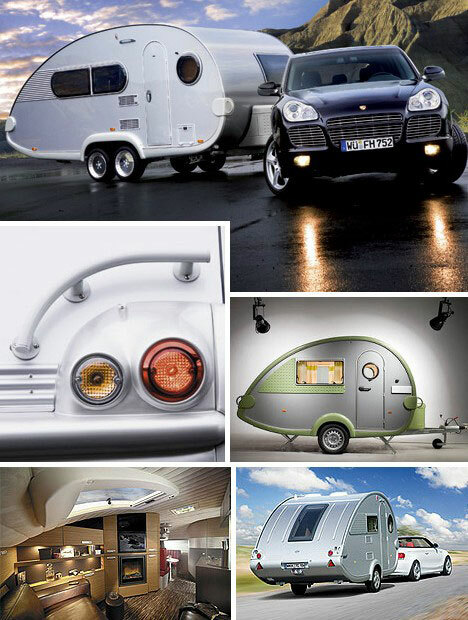 The [email protected] XL takes the classic teardrop trailer concept and lifts it into a new level of luxury. [email protected]’s (pronounced “Tab”) lesser models are anything but trashy but the twin-axle XL definitely rules the roost. Sleekly styled, the XL still stretches 22 feet from stem to stern and is expected to be priced in the $60K range. That is, if manufacturer Knaus Tabbert manages to emerge from bankruptcy – times are tough for the purveyors of luxo-goods. You’ve seen cars towing motorcycles, but how about ‘cycles towing cars? They may be scaled down a mite but these very cool trailers still evoke the spirit of pinstriped, big-tired muscle cars. 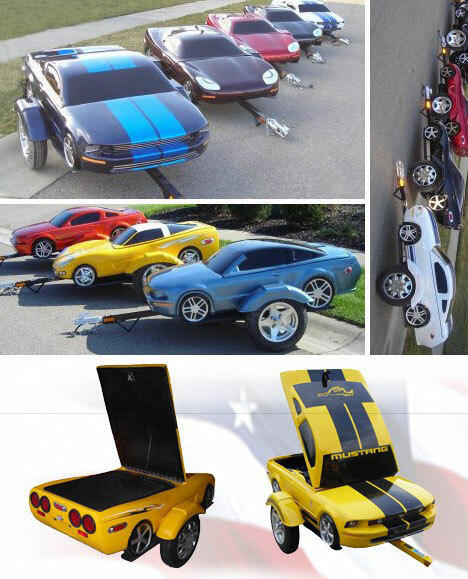 Mustangs and Corvettes are featured but the manufacturer, American Custom Trailers, also takes custom orders. 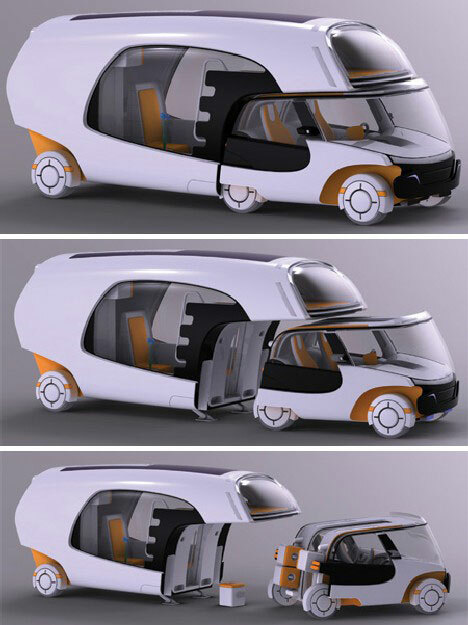 This intimidating mobile home concept from General Motors Advanced Design Group shows the beleaguered corporation isn’t bankrupt – at least when it comes to provocative ideas. The GMC PAD is sort of a Winnebago on steroids that sports 6 wheels, an enormous full length (and width) windshield and a curious articulating feature that extends a step-like device out from the, er, fuselage to ease entry and exit. The PAD runs on a diesel-Electric hybrid system and its innovative resource management technology ensures onboard fuel and water supplies will last weeks, even months! The Tumbleweed Tiny Home Company has got a good thing going. 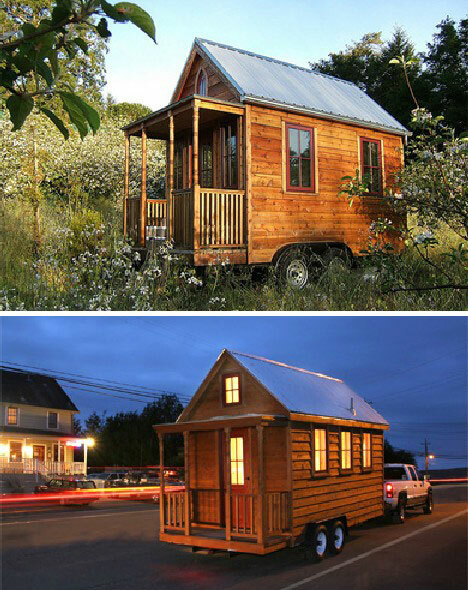 These tiny perfect houses come mounted on wheels, so by law they’re considered travel trailers and thus a building permit isn’t required. 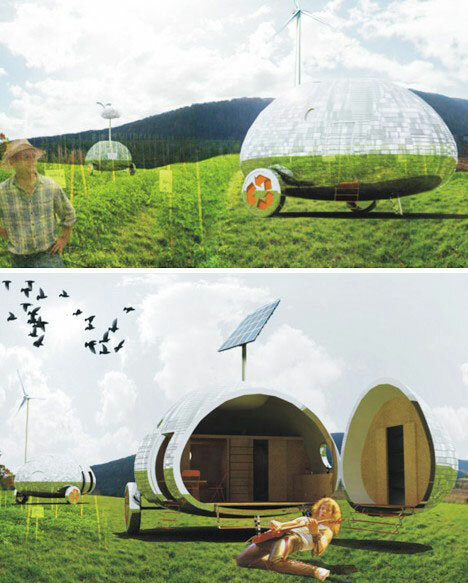 Tiny they are, however: could you live in 65 to 140 square feet of space without padding the walls? The Capsule Caravan may look lke an oversized M&M but there’s nothing nutty about what’s inside. 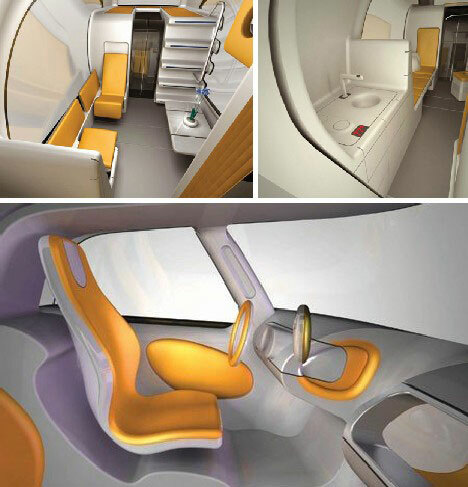 British designer David Tonkinson engineered the ovoid trailer to separate into distinct Comfort and Service Pods to keep men and machines apart. 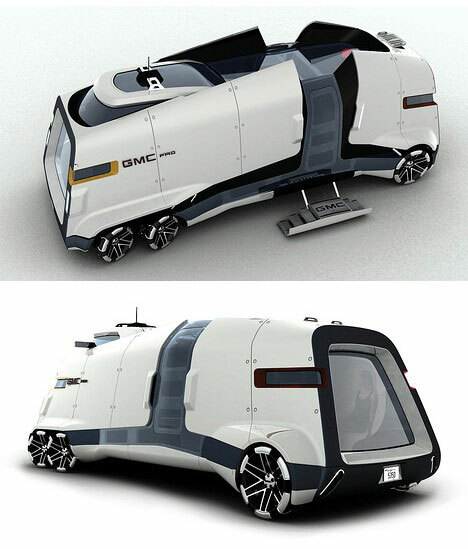 Conceived as a way to take in summer music festivals by day while resting comfortably by night, the Capsule Caravan is one of the sharpest trailers around – and that’s saying something as it’s one of the smoothest designs going!